£24,000-£30,000. That's the cost to government per year of each homeless person in the UK, according to a recent DCLG report. It takes account of costs in terms of health care, welfare benefits, criminal justice, and the work of local authorities. What interests me is that only costs to central and local government have been included. 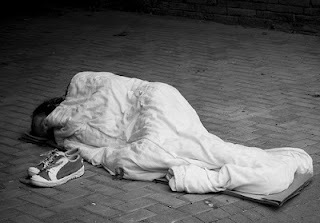 No consideration is given to the human costs of homelessness - to homeless people themselves, to their families and friends, or to wider society. This contrasts with cost estimates used by government in other contexts. Department of Transport analysis of road safety schemes is a prime example. If road safety improvements were based solely on the costs to A&E and emergency services of a few extra accidents, they would often be small in comparison to the cost of those improvements. In practice, DoT calculations also consider the human costs associated with injury, death and the suffering of relatives. It isn't easy to put a financial figure on such things of course, but it can be done and is done. It's the same principle as used in Social Return on Investment (SROI); that of assessing what changes for everyone involved and putting a value on those changes. I'm certain there are ways of doing this with homelessness as well, but the DCLG report does not attempt this. In consequence, the figures suggested, although significant, look fairly modest. To be fair, the report is simply an evidence review and does not include any policy recommendations. It also recognises that homelessness is not a unique category, and that problems often overlap with drugs, alcohol abuse and mental health issues. However I still think it is potentially misleading to imply that future policy on homelessness might be based on such limited evidence. It would be sad indeed – although perhaps not surprising in the current climate – if government policy were based purely on how much money government could save.